Bowling Green beat a ranked team for the second time this season Saturday night. The Falcons played well offensively and defensively, and Tommy Burke stopped 26 shots in a 3-1 win over Minnesota State at the Ice Arena. The victory was a relief following Friday’s 5-2 loss when the Falcons didn’t play well after taking a 1-0 lead early in the first period. 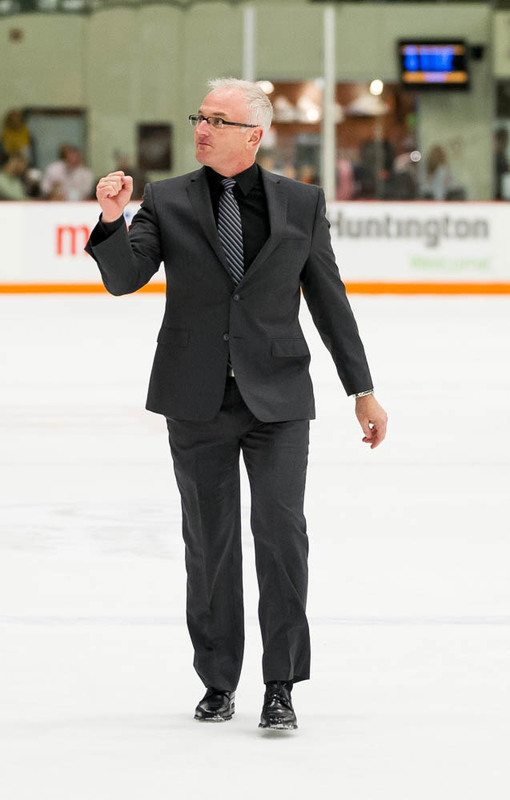 MSU is the coaches pick to win the Western Collegiate Hockey Association. The Mavericks returned many of the key players from last season when they won the league playoff championship. “It’s definitely big for us,” said Falcon senior Adam Berkle, who helped set up Tyler Spezia’s game-winning goal in the third period. Berkle kicked the puck across the front of the net to Spezia, who scored his third goal of the series with a backhander from the right side of the crease. “It shows we’re resilient from last night. We came out strong and wanted to finish it,” Berkle said. 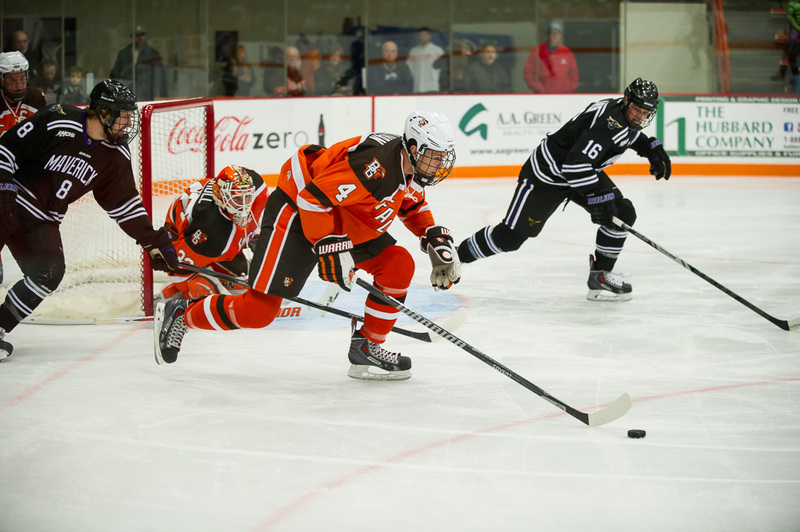 The Falcons, who believe they’ll contend for the league title even though they were fourth in the coaches voting, improved to 5-2-1 overall and 3-1 in the WCHA. MSU is 5-3, 3-1. BG split with 10th-ranked Miami to start the season. DIFFERENCE: The Falcons played well from the start Saturday, although they were out-shot by a 27-21 margin in the game. BG had 10 more shots blocked and 13 others missed the net. BG had a physical presence in both its offensive and defensive zones. The Falcons played more of the game in their offensive zone, something they do consistently when they’re at their best. The work leads to scoring chances and slows MSU’s transition game. The Mavericks had plenty of offensive depth, and speed and skill. MSU scores 3.38 goals per game. DEFENSE: The Falcons defended well after allowing five goals Friday. BG finished its checks and limited the number of odd-man rushes MSU had. Burke also made the save when needed, stopping 26-of-27 shots. “Our defending was not up to par (last night). We needed to defend at a higher level,” Bergeron said. BG is allowing just 2.25 goals per game. CLOSE CALLS: The Falcons are 4-0 in games they lead after two periods after struggling last season to hold the lead in the third period. BG also is 1-0-1 when it is tied after two periods this season. “Tonight was a good example of us maybe taking a step in the right direction as a program,” Burke said. “We want to win at a championship level. We’re not here to finish in the middle of the league. We’re here to win championships. Championship teams close out games in any sport. Like MSU in the WCHA, Miami is one of the favorites to win its league title. 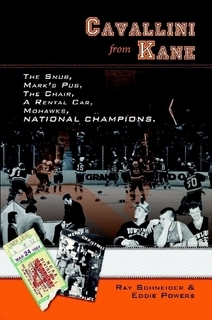 The RedHawks play in the National Collegiate Hockey Conference. TOO MANY MEN: MSU tied the game at 12:28 of the second period with a disputed goal, that came after BG thought the Mavericks were guilty of two many men on the ice. Thompson might have played the puck a split second before the player coming off for him was entire off the ice. The Mavericks came hard after tying the game, but BG survived to keep the game tied heading into the third period. BG then played a solid third period, scoring twice for the win. VETS: Berkle had one of his best weekends of the season, capped by the assist on Spezia’s winning goal. After DeSalvo dumped the puck into the MSU zone, Berkle forced a turnover by All-WCHA defenseman Zach Palmquist. Berkle and Palmquist tied each other up to the left of the net, Berkle managed to kick the puck to Spezia. Dan DeSalvo also played well both nights for the Falcons, and Mark Cooper and Ben Murphy also contributed Saturday. 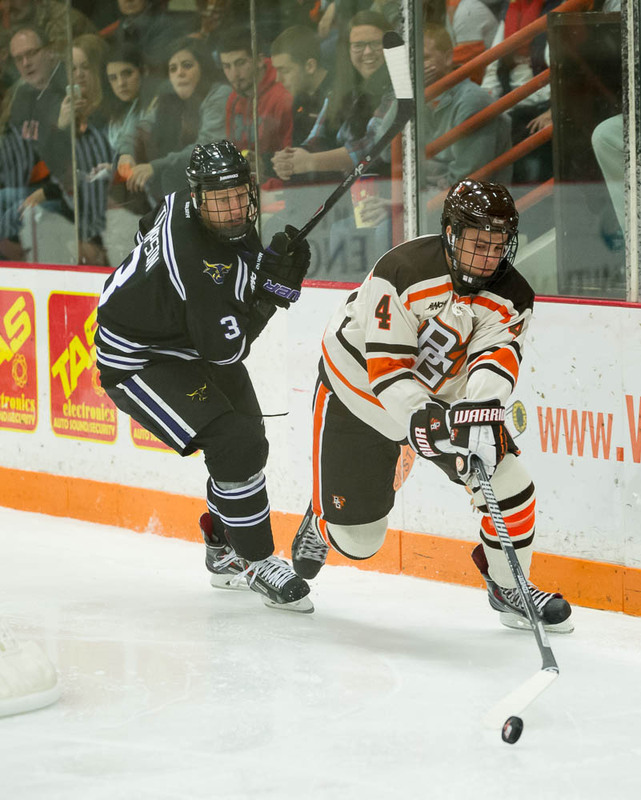 The four are BG’s key veteran forwards, but had only two goals coming into the series. DUFOUR: Kevin Dufour scored his national-leading ninth goal of the season with just 1:49 remaining to give BG a 3-2 lead. Linemates Matt Pohlkamp and Pierre-Luc Mercier combined to set up the goal. Dufour didn’t score a goal Friday for the first time this season, but rebounded to make it seven goals in eight games Saturday. PP/PK: The Falcon penalty-killing was solid as BG didn’t allow a goal in six attempts. MSU was 1-of-2 in the series opener. The Falcons did a good job of keeping MSU to the outside, and was effective blocking shots. The Mavericks had just nine shots in 8:39 with the extra man. BG killed two MSU power plays in the third period, and a 5-on-3 power play for 1:07 with the game scoreless in the first period. The Falcon power play was 0-of-4 in the game and 0-of-5 on the weekend. Saturday’s game had 12 penalties, resulting in a significant amount of 4-on-3 power play time for each team. FRESHMEN: BG freshmen forwards Brandon Hawkins, Mitch McLain, Spezia, Brett D’Andrea and Jacob Reichert have combined to score 11 of BG’s 26 goals. D’Andrea scored his first career goal in Saturday’s game. They’ve also combined for seven assists, and play on BG’s special teams.